Dotfiles and dotfile management are a foundational keystone to an organized, repeatable workflow. They are a must if you’re a developer, and also become critically important to properly manage if you’re planning on running Linux as your primary desktop experience. Dotfiles are plain-text configuration files for various programs that you use. These files typically reside in the root of your home directory (e.g. /home/grant) and are prefixed with a dot (e.g. /home/grant/.vimrc). Dotfiles are becoming a more general term for any type of configuration file needed for your setup. Most programs nowadays are slowly moving to the XDG base directory specification, which define $XDG_CONFIG_HOME as $HOME/.config. This is why you now see many files in ~/.config/programname/configfile. Having a meticulously organized set of dotfiles is good hygiene and good practice. Disasters happen. Laptops get lost or stolen. Hard drives die. When dotfiles are properly managed, it allows you to get your computer back to feeling like “home” very quickly! Use commit messages to help documented why a change was made to your configs. Add to the collective hivemind of the greater community. Learn from others, and have others learn from you. It’s a good idea to store your dotfiles in Github, under the “special” name dotfiles (by convention). Most people do not actually put the dots in front of the filenames they store in the repo. So for instance, in the repo, your .vimrc would actually be stored as vimrc. Any personal executable scripts you have should also be stored here, in a bin folder. You can then set up your PATH to include ~/.bin to have access to those scripts. If you plan on really hacking your Linux desktop experience or using a tiling window manager like i3, good dotfiles hygiene is a must. You’ll be storing all of your hard-earned configs there. Additionally, any directories in your dotfiles repo should be installed with dots in front of them as well. For instance, the installer should create a symlink called ~/.config for your folder in ~/dotfiles/config. RCM - ThoughtBot’s homegrown tool for managing dotfiles. This is the one I personally use. GNU Stow - The old school choice. Dotbot - Uses a YAML or JSON file to store configuration. You now have a plaintext file on your hard drive that is storing sensitive information. There are tools for handling sensitive info, so use them! Crash reports that get shipped off usually include environment variables. You don’t have control over where your secrets go. On a desktop machine, processes can easily spawn many sub-processes, each of which now has access to sensitive environment variables. A good alternative is to Use a password store like pass or lpass and store sensitive info as a note. You can write a quick script to decrypt and use in an environment variable as needed. It explicitly limits the scope of how far sensitive information can travel, and it keeps this info behind your passphrase. Their starting vim configuration includes vim-plug, Ag, Rails.vim, and Ctrl-P out of the box. Sensible defaults for using git, rspec, tmux and ag. When using Thoughtbot’s dotfiles, your own personal configs would go into ~/dotfiles-local. The benefits of using a set of base dotfiles is that someone has already culled together best practices. A drawback, however, is the cognitive load associated with actually learning what is in them, how they work, what shortcuts they provide. If you’re declaring dotfile bankruptcy (which I have, twice), or are just starting out, it’s worth considering base dotfiles that are sensible. I like Thoughtbot, and I consider their dotfiles sensible, which is why I chose them as a good base. Dotfile management becomes even more important if you’re crafting together a linux desktop experience. I am personally running i3wm. All of i3’s config is in a single file, stored in ~/.config/i3/config. Many users of i3 also use a nice bar called Polybar which stores its config in ~/.config/polybar/config. (See the pattern yet?). There’s also keyboard/mouse settings, dunst (a minimal notification manager), and others! Basically, your whole desktop configuration comes under the umbrella of dotfiles. Therefore, managing your dotfiles effectively becomes crucial to having a good experience. I am running i3 on a laptop and a desktop machine, and each have slightly different configs. For my own dotfiles, I keep 2 different branches for each config (master and laptop in this case). 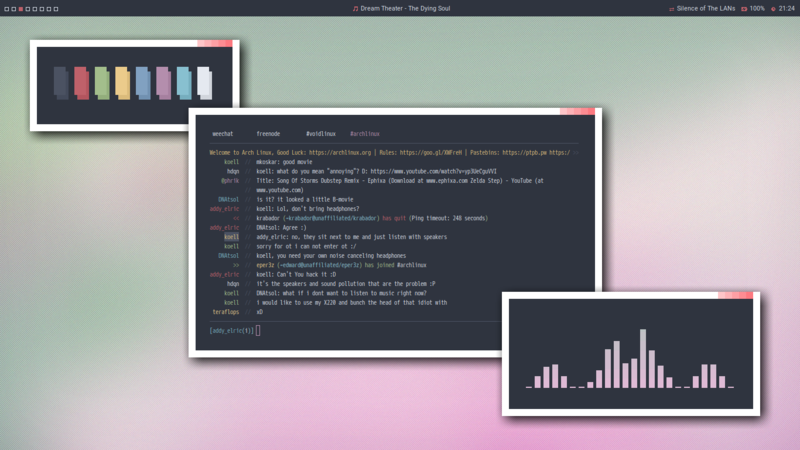 I am a frequenter of the /r/unixporn subreddit (safe for work despite name) where you can get inspired and see fantastic looking desktops. Most of the content submitters also share their dotfiles so you can replicate their setups! Some folks get quite creative with their desktop setups, and they are always happy to share their dots! Alongside /r/unixporn, Luke Smith has a great (albeit extremely meme-heavy)Youtube channel walking through the benefits of using a tiling window manager. He also shares his dotfiles and focuses on teaching others on how to craft a desktop experience like his. Good dotfile hygiene is important for having a nice, repeatable, enjoyable computing experience. It allows you to stay organized, easily port your setup to other machines, and to have confidence to experiment without messing things up. If you’re striving for a fantastic Linux desktop experience, dotfile management becomes essential, because that’s how you’ll be tweaking and refining your entire desktop experience. I hope after reading this, you’re excited to experiment, curate, and move your dotfiles to the next level!